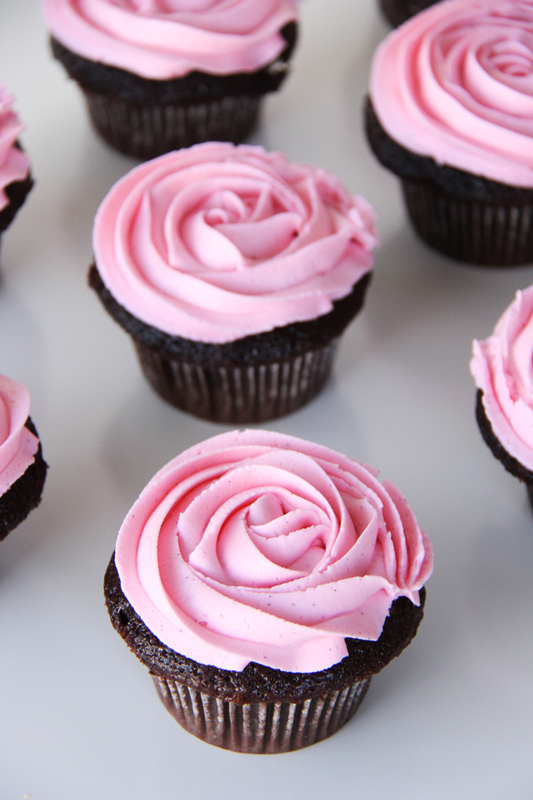 Hi it’s me Jo-Anna from A Pretty Life in the Suburbs back to share a delicious recipe for Chocolate Cupcakes with a Chardonnay Buttercream Frosting, and just in time for Valentine’s Day. Actually, let’s be real, cupcakes are perfect any time of year! Or day… breakfast, lunch or dinner anyone? Yes, you read that right…I made frosting with Kendall-Jackson Vintner’s Reserve Chardonnay! Have you ever tried such a thing? You should, the flavour is amazing. You get all the taste of a delicious buttercream with the added flavour of Chardonnay, and the combination of the two works perfectly together. Then spread this frosting over chocolate cupcakes, and you have an amazing dessert. Since we’re talking cupcakes, if you have been searching for the perfect soft, moist and super chocolatey chocolate cupcake, look no further. This recipe is divine. These cupcakes are so moist that they’re even delicious 2 days later! But if you’ve got a crowd to feed they won’t last that long! 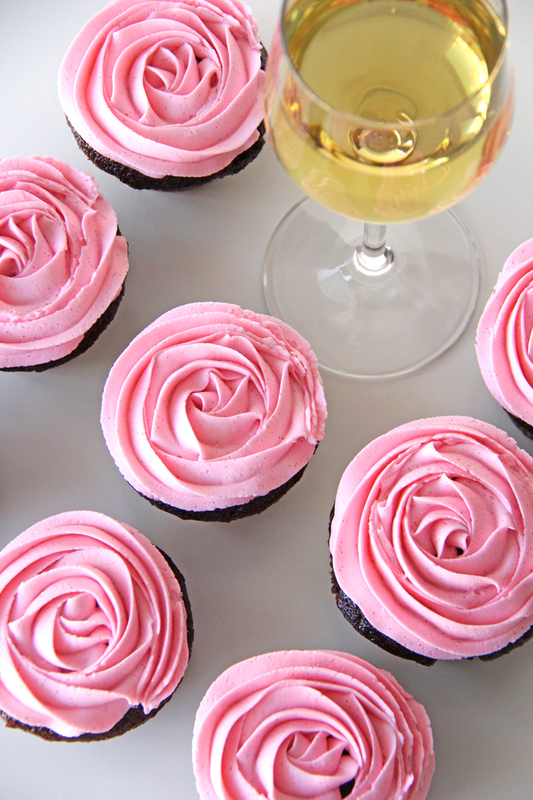 So to make your day a little more special, bake up a batch of these delicious cupcakes and enjoy them with a nice glass of Kendall-Jackson Vintner’s Reserve Chardonnay. Invite some friends or share them with your honey. That sounds like a perfect evening. Prep your baking pans with cupcake liners. You can either make 18 large cupcakes or 24 medium. Into a mixing bowl, sift together the flour, sugar, cocoa, baking soda, baking powder and salt. In another bowl whisk together the eggs, coffee, buttermilk, oil and vanilla. Add the milk/egg mixture to dry ingredients, and mix on medium speed for about 2 minutes. Pour your batter evenly into your prepped cupcake pan. Gently tap the pans on the countertop to remove air bubbles. Bake for 15 - 20 minutes, or until a toothpick inserted in the centre of a cupcake comes out clean. Let the cupcakes cool fully before frosting. In a mixer, beat the butter until soft and fluffy. You'll have to scrape the sides of the bowl several times. This process of getting fluffy butter takes at least 10 minutes. Add the vanilla and heavy cream and beat until smooth. Beat in the chardonnay, 1 tbsp at a time so that you may adjust to your taste. I used the 4 tbsp for our cupcakes but we really liked the strong chardonnay flavour. 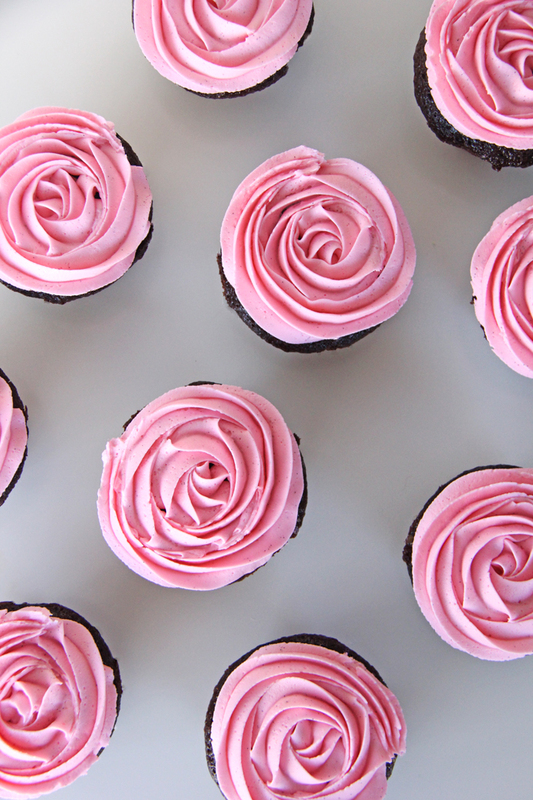 I used a Wilton 1M tip to make the icing roses. The addition of the coffee enhances the deep chocolate flavour, but if you wish, you may substitute it with water. These chocolate cupcakes are also so delicious with my Marshmallow Vanilla Buttercream Frosting that I’m sharing over on my blog today! Pop on over to my site to get the delicious recipe for this frosting!